With hard work, difficult material can be grasped. Step by step, incrementally, the novice can become the master. — Joshua Waitzkin, World Tai Chi champion and subject of the book 'Searching for Bobby Fischer'. He is working with Khan Academy to promote learning through hard work. Figure 1: Lump of Bituminous Coal (Source). I had never seen coal until my first trip to China when I saw people on bicycles transporting coal to their homes for heat. I started to wonder just how much heat a given amount of coal would generate. I have seen numerous values for the heat content of the various types of coal. I recalled from primary school that there were three types of coal: anthracite, bituminous, and lignite. So I would have expected three values for the heat output of coal. When I actually looked, I found dozens of grades of three primary types of coal. Each of the different grades would generate different amounts of heat per kilogram. I thought I would take a closer look at how the heat output from coal could be modeled using regression and a simplified model based on chemical heats of formation. I am currently taking an online statistics class and this exercise provided me some good R practice. Scrape some coal data from the web (source). 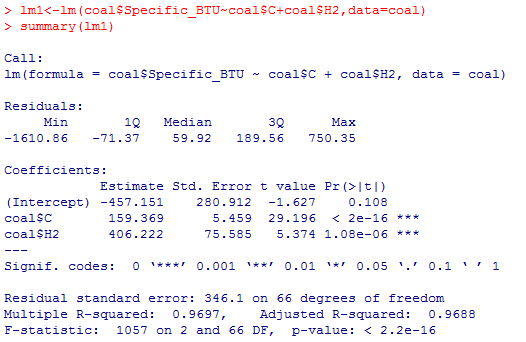 Perform a regression on the coal data. Compare the results of the regression to a simple model based on chemical heats of formation. The standard enthalpy of formation of a compound is the change of enthalpy during the formation of 1 mole of the compound from its constituent elements, with all substances in their standard states at 1 atmosphere (1 atm or 101.3 kPa). Its symbol is ΔHfO or ΔfHO. The waste left over after coal is burned to generate power, contains concentrated amounts of heavy metals, such as lead, mercury, arsenic, chromium, and selenium, which are hazardous to human health, and to wildlife. Proximate analysis entails first weighting a sample, then heating the sample of coal to a high enough temperature drive off the water from the sample. and then reweighing the sample. The weight loss divided by the initial weight gives the coal moisture content, M. The remaining material is then heated at a much higher temperature, in the absence of oxygen, for along enough time to drive off gases. The resulting weight-loss fraction gives the volatile matter content, VM, of the coal. The remainder of the sample is then burned in air until only noncombustibles remain. The weight loss gives the fixed carbon, FC, and the remaining material is identified as non-combustible mineral matter or ash, A. The proximate analysis may be reported as percentages (or fractions) of the four quantities: moisture, ash, volatile matter, and fixed carbon. This analysis has the advantage of being simple to perform, but it does not related the coal sample's heat of formation with the specific chemical contents. I will not be using proximate analysis for my modeling, but I mention it here because it is reports include it in discussions of coal grades. A more sophisticated and useful analysis is the ultimate analysis, a chemical analysis that provides the elemental mass fractions of carbon (C), hydrogen (H2), nitrogen (N2), oxygen (O2), and sulfur (S), usually on a dry, ash-free basis. The ash content of the coal and heating value are sometimes provided also. I will be focusing on the results of ultimate analysis for my modeling. For the discussion here, I will assume that coal is composed of the following elements. Different types of coal are are characterized by the constituent percentages of these elements. These elements are measured as part of the ultimate analysis of a coal product. Carbon reacts with atmospheric oxygen to produce the bulk of the heat generated by coal. The primary reaction produces CO2, but there is a secondary reaction that produces CO. I will ignore the heat generated by the CO reaction. When hydrogen burns with oxygen it forms water (H2O). There are two heats of formation listed for H2 because the water formed is in the form of steam. The amount of heat realized depends on whether you let the water condense or you just let the steam escape into the atmosphere. A source of heat and SO2, a major source of atmospheric pollution. There a number of nitrogen reactions that produce some heat, but they are not dominant. The heat of formation of O2 is not a significant source of heat from coal. Ash is left over from burning coal and presence major disposal challenges because it contains unsafe compounds. Figure 2 shows a pair-wise plot of the coal data to help me determine which factors are significant (click on the Figure 2 to see the full-size plot). As I look at the plot, I see that C and H2 look the most significant. I should note that many papers include the energy from burning sulfur, but the data here does not show it to be significant. Figure 2: Pair-Wise Analysis of Ultimate Analysis Variables. Figure 3 shows my plot of the coal data from Appendix B. We can see that the data is fairly linear with respect to the C and H2 percentages. I have included my regression line, the coefficients for which I will generate in the following section. 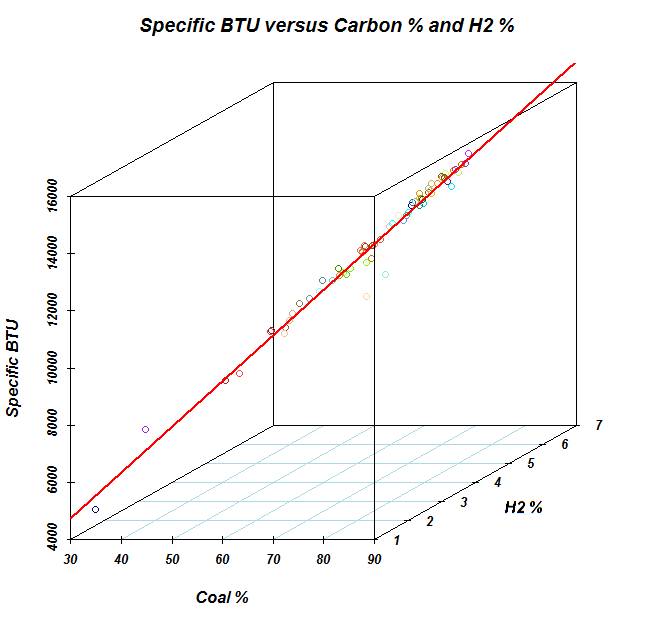 Figure 3: Plot of Coal Data Versus Coal and Hydrogen Percentages. The red line is my regression model, which is documented below. I started my analysis of the data by performing linear regression assuming all the ultimate parametrics C and H2. The regression of Figure 3 produces the following linear model (Equation 1) for the energy output in BTU for a pound-mass of coal. As you can see in Figure 3, the regression line fits the data well. I now want to compare my linear regression (Equation 1) with an approximate chemical model. The chemical model is approximate because I only deal with the dominant chemical reactions in burning coal. Equation 2 shows my simplified model. My chemical model has no intercept term. is the heat of formation for H2O at STP. is the heat of formation for CO2 at STP. MWC is the molecular weight of carbon. MWH2 is the molecular weight of diatomic hydrogen. kC is the percentage of carbon in the coal grade in question. kH2 is the percentage of diatomic hydrogen in the coal grade in question. We can estimate the heat output based on the heats of formation (Appendix A) for the dominant C, H2, and S chemical reactions, which I show in Figure 3. Figure 3: Derivation of Coefficients Using Heats of Formation. We can substitute the values from Figure 3 into Equation 3 to see my estimate using the key heats of formation. You can see that the coefficients of Equation 3 is similar to those of Equation 2, so the models are consistent. 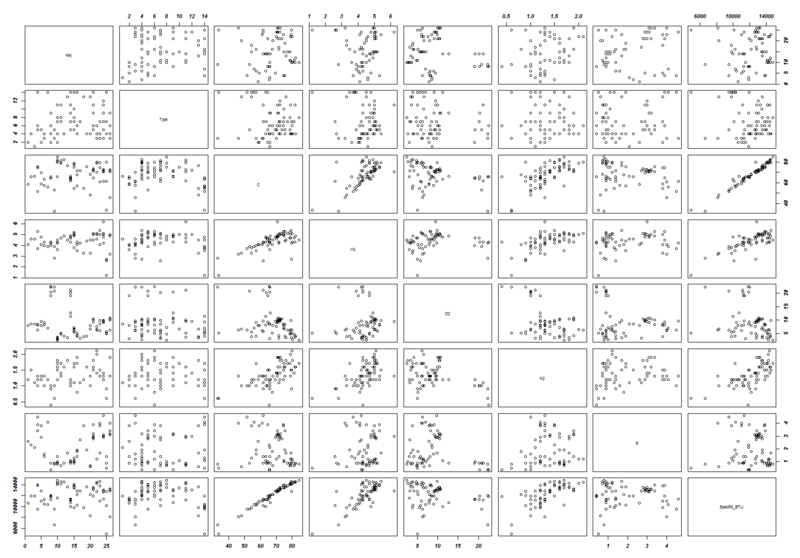 I was looking for a good multivariate R exercise and this coal data provided that exercise. Appendix A: Heats of Formation for Key Coal Reactions. Table 1 shows the assumed heats of formation for the various compounds associated with coal. Table 1: Heat of Formation for 1-Bar Pressure and 298.15K Temperature. Appendix B: Examples of Coal Grades. While Table 2 is a bit of an eye chart, it does provide some useful examples of the different grades of coal. There energy output per lb varies dramatically – from a maximum of 14,820 BTU per pound down to 4,918 BTU per pound. This is a dynamic range slightly over 3 to 1. Table 2: Coal Constituents By Grade. This entry was posted in General Science, Statistics. Bookmark the permalink.